All I can say before you watch this Video that my Brother sent to me today is; “Turn the FECKING sound up”, this 6.3 Liter- 6 speed growls out a 809 HP Sizzle. the Young Kid I think is the Owners son and he looked a little more than worried at a few turns, but Guy LOVED it! Just listen to the awesome cackle of the V12 2 seater Berlietta as guy gets to grips with it for the first time, he has never driven this so took it easy, but I love this sound when she is on the PIPE. The FXX uses some technology developed from the Enzo Ferrari, and combines it with some new developments from Ferrari and its suppliers. However, the car is only a part of the overall program. 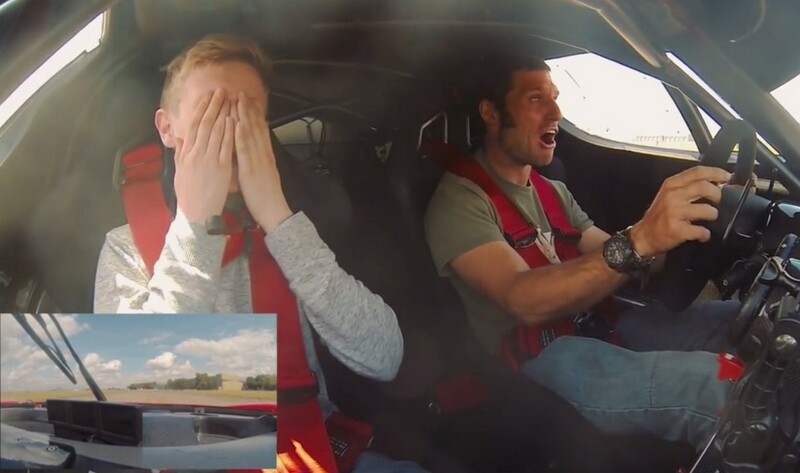 Customers pay £2 million, but are only allowed to drive the car on special track days which are approved by Ferrari. After they drive the car, the owners are entitled to be briefed by Ferrari on the car’s performance. Ferrari’s sister company, Maserati, has developed a similar car, the MC12 Corsa. It is suspected[by whom?] that Ferrari closely guards the FXX due to the car incorporating various advanced technology from Ferrari’s F1 team that the company did not want being inadvertently released to rivals. The FXX’s engine is based on Enzo’s, but displacement has been increased to 6,262 cc (6.3 L; 382.1 cu in) from 5,998 cc (6.0 L; 366.0 cu in). Output has been boosted from the Enzo’s 670 PS (492.8 kW; 660.8 hp), to 820 PS (603 kW; 809 hp) at 8,500 rpm. The gearbox incorporates the latest developments from Ferrari’s F1 program and has a shift time of under 100 ms. The brake pads were also upgraded from the Enzo. It does, however, retain the Carbon fibre-reinforced Silicon Carbide (C/SiC) ceramic composite discs found on the Enzo. The tires are custom-developed 19 inch slicks. The FXX features comprehensive data-monitoring and telemetry that not only allows the driver to improve performance, but also provides Ferrari technicians with valuable data to improve the FXX and future road-going Ferraris. Ferrari has built 30, adding one special edition to the 29 that were originally planned. The original 29 have all been sold to pre-selected past Ferrari customers. The 30th was retained by Ferrari S.p.A. and presented to Ferrari’s F1 World Champion driver, Michael Schumacher, when he retired from Formula One racing at the end of 2006. Schumacher’s FXX differs from others in being black without a stripe, having red trimmed wheels, matte rather than chrome exhaust tips, and his personal logo stitched on the racing seats. 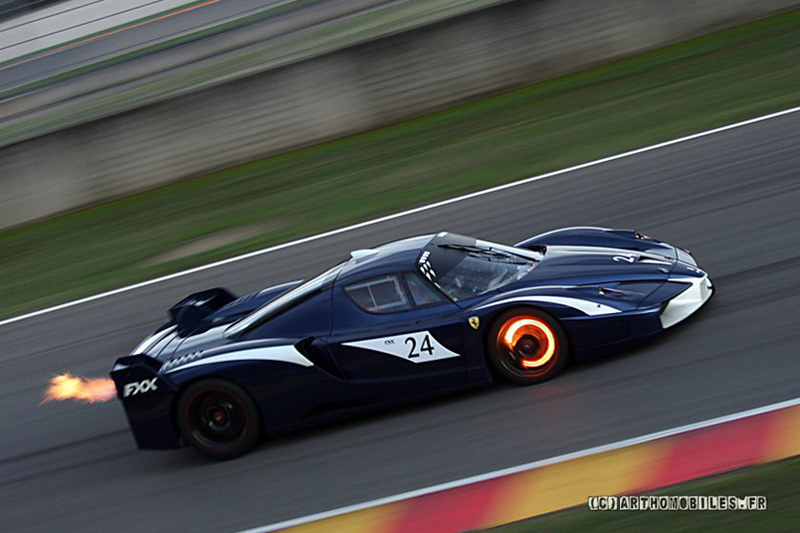 FXX owners also participate in Ferrari’s testing and brand development programs. As part of the FXX programme, the car is maintained by the Ferrari factory. The purpose of this particular program is to allow Ferrari’s top customers exclusive access to its most up-to-date technology and to utilize their input in the development of future models. The model was only sold in Europe. Units can be imported, but not owned, in any other continent. The FXX Evolution package was reported to cost 1.5 million euros (excluding taxes) (2.1 million USD), including the car, the crew and the services provided by Ferrari. Between 2005-2007 there were only 30 produced and I’d love one of these for sure! 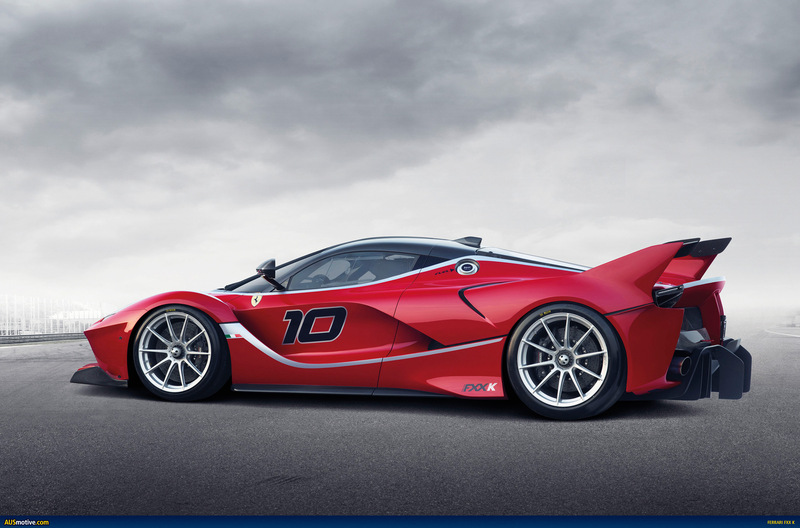 This entry was posted in Blog and tagged Enzo, ferrari, FXX, guy martin, isle of man, legend, Super car, tt.